Stories are the way we learned our history long before there were schools. That’s the way we learned how to behave – what do to and what not to do. Now many of the people who remembered the old ways and could tell those stories have passed on. We hope that the traditional tales of the wily old Raven come back to life through the pages of this book. Traditional stories take place at the Time of Beginnings in the world, back when animals were like human beings. They could talk and paddle canoes and live in longhouses. 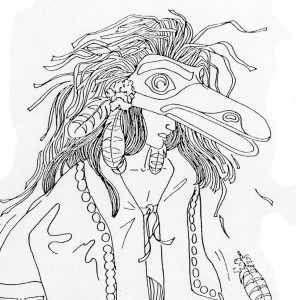 Like other groups farther north along the Pacific coast, our stories have Raven as the main trickster character. Native groups south of us have Bluejay as their trickster, while those in the interior of Washington and Oregon or parts of the Southwest feature Coyote in their traditional stories. Whether the trickster figure is Raven, Bluejay, or Coyote, he is important. He brings light to people by creating the sun, moon, stars, or causes the tides so people can harvest clams and other shellfish. To do this, he often transforms into a completely different shape. Some of our traditional stories explain how things came to be inthe world. Other trickster stories are about the way you should behave-that being generous is better than being selfish, that working hard and being true to yourself is more important than trying some copycat shortcut. We hope you’ll enjoy our stories and learn from wily Old Raven, just as Quileute children did long, long ago.